According to the Southborough Historical Society, “The Joseph Burnett Company unofficially began in 1847 when druggist/chemist, Joseph Burnett developed a vanilla extract for flavoring foods. At the time, he was a partner with Theodore Metcalf, a Boston druggist. Joseph Burnett began as an apprentice to Theodore Metcalf in 1837, shortly after graduating from the Worcester College of Pharmacy. In 1845, at age 25, he became a full partner of the newly named Metcalf and Burnett Chemical Company. Before long, he earned a reputation for selling only products of the purist quality. In 1848 Joseph married Josephine Cutter and they had 12 children. Although famous for developing a vanilla extract, Joseph Burnett also had a role in the first publicly demonstrated use of ether to conduct a painless surgery. Dr. William Thomas Green Morton, a Boston dentist, was experimenting with the use of ether as an anesthetic at the Massachusetts General Hospital in Boston. He had poor results and realized the ether he was using was impure. Another doctor (Charles T. Jackson) told him to buy all of his drugs from Joseph Burnett to insure their purity. Dr. Morton bought his ether from Joseph Burnett and performed the first successful painless operation on October 16, 1846. In 1847 a prominent lady and wife of a wealthy Boston manufacturer who had lived some years in France, entered the store of Joseph Burnett. She said she was very anxious to procure a vanilla flavor for her creams, sauces and desserts, such as she had been getting in Paris. At that time the only extract of any kind in this country for flavoring purposes was a cheap extract of lemon. A few French chefs used the vanilla bean itself. This was the clumsy, unsanitary and inconvenient way these chefs got their vanilla flavoring; they would purchase one or two vanilla beans, cut them up and put them in a linen bag, ready to use like a tea ball, to flavor whatever was required. The results from this tedious, inexact method of extracting the flavor were of course very unsatisfactory. When the bag was first used it would give the delicious flavor of pure vanilla, but afterwards, when it became diluted, the taste was weak and unpalatable. It was never uniform in strength or flavor. It was always expensive because the full rich flavor could never be thoroughly extracted. Mr. Burnett listened to the lady’s description of the flavoring she wanted. This extraordinary request challenged Mr. Burnett’s resourcefulness. A man ahead of his time, he believed in supplying what his customers needed, if he could. He busied himself in his laboratory. He [went to New York] and bought a pound of the very best vanilla beans he could procure [for $3.50] and extracted the rare, delicate flavor of which she spoke, and after long, careful experiments, when he was satisfied with its quality, he made the first Vanilla Extract. “The lady was so pleased she urged him to make more, promising to take her supplies of it from him and to introduce it to her aristocratic friends. This was the beginning of Vanilla and other extracts in this country and throughout the world. Joseph Burnett soon saw that if one flavor made business good, additional flavors would make business even better. In 1858 he became a partner with William G. Edmonds and the company became known as Joseph Burnett & Co. Soon his products were sold not only in the United States but all over the world as well. This policy of continuing to introduce new products distinguished the company throughout its history. By this time, the Company produced Lemon, Vanilla, Almond, Rose, Nutmeg, Peach, Celery, Cinnamon, Cloves, Nectarine, Ginger and Orange extracts. They also produced and sold, Wood Violet Perfume, Cologne, Cocoaine for the hair (which he invented in 1857 and sold for over 40 years), Florimel (a perfume for the handkerchief), Kalliston (for a healthy skin and complexion), Jamaica Ginger (for the stomach), Oriental Tooth Wash, Cod Liver Oil, Jonas Whitcomb’s Asthma Remedy and several other personal/medical products. By the early 20th Century, with the stricter drug laws and regulations, some of these products were no longer produced by the company, so only food related products and some toiletry products would be marketed. By the 1930’s the Joseph Burnett Co. was engaged solely in the preparation of flavoring extracts, color pastes & liquids, spices, and mixes. In 1894, just before Joseph Burnett died, a new factory was opened at 36 India Street. About this time the increasing interest in fancy cooking warranted the marketing of a pure color for coloring candies, frostings, etc. 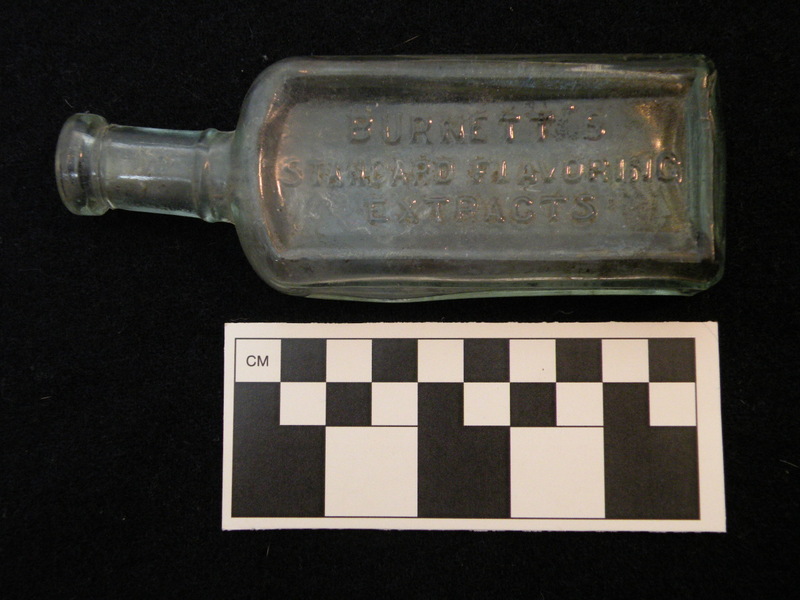 After extended experimenting in the laboratory and kitchen, Burnett’s Color Pastes were on the market. The Joseph Burnett Company was incorporated in 1895. Joseph’s sons, Harry (treasurer) and Robert (interim president), and John T., who later (1907) became president of the company, continued the manufacturing policy of their father, which was to make the very finest extracts that could be made and advertise the fact to the consumer. The wisdom of this policy can be discerned in the steady growth of the sales, which by the 1920’s necessitated the building of a fine new factory, equipped with all the latest machinery for manufacturing, packaging and handling the various products. In 1919, after a careful market analysis, it was decided that fine spices could be handled to advantage, and so Burnett’s Spices, the choicest grown in the tropics, were added to the extract line. During the 1920’s thru the 1940’s, the Burnett Company added Mint Jelly, Marshmallow, Flavored Puddings, a Liquid-Mix for making Ice Cream and Sherbet, a Ready-Mix Powder for making ice cream, and a Pie Crust and Muffin Mix. Many different flavors and colors were added to the extract, food coloring, and paste products. At this time Burnett’s boasted 29 extract flavors. The Joseph Burnett Company, a division of American [Home] Foods, Inc., and known for more than a century for its flavoring extracts and food colorings, introduced instant puddings of chocolate, butterscotch, and, of course, vanilla in 1951. Joseph Burnett & Co floral handbook, 1879. Joseph Burnett Co. ad, undated. Doubly Delicious Desserts (not dated, 48 pages) was one of several recipe booklets published by the Joseph Burnett Company of Boston, Massachusetts. Great article but one small correction – Joseph and Josephine Burnett had 12 children not just 4 as mentioned. As an aside, the Burnett family still holds a family reunion every 2 years in the town of Southborough, MA where Joseph and Josephine lived. John. Did the Burnett family have the Boston 437-447 D Street building designed and built? Or was it pre-existing and they just moved the company in? This would be around 1922.
i found one of these in my yard… any value ? What are the extract bottles worth? I work construction I came across a 5 gallon jar still in crate of vanilla extract. Still full and crate and the bottle has never been opened. I want to know what it’s worth. Actually, Burnett’s hair preparation had nothing to do with cocaine. It was a hair tonic made from coconut oil (or cocoanut, to use a 19th-century variant spelling), and its name Cocoaine was apparently meant to be pronounced “Cocoa-een.” I remember my grandmother always having Burnett’s vanilla extract in her kitchen.